October is National Cyber Security Awareness Month, a month dedicated to raising awareness about cybersecurity. Out of this campaign, a new initiative was just announced by the Obama Administration called Lock Down Your Login. It hopes to educate users on the importance of setting stronger passwords for online accounts. According to the Lock Down Your Login website, 72% of Americans believe their accounts are secure with usernames and passwords. Yet every two seconds, there are victims of identity fraud. The initiative argues that you should go beyond a username and password to keep your information is kept safe. They suggest using stronger authentication. This helps websites that require login information make sure that you are who you say you are. Strong authentication is much easier than it sounds. 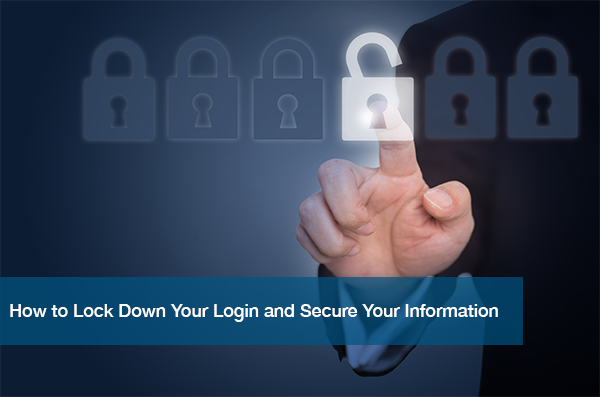 In fact, you have many easy options available to ensure the safety of your login information. Many people think their accounts are secure by using simple usernames and passwords. But, The National Cyber Security Alliance still sees too many accounts using “1234” or “abcd”. They say that a strong password is actually 12 characters long and is a full sentence or phrase. It also incorporates numbers and symbols. You don’t want to make it too hard for yourself, but hard enough so that others can’t figure it out. Biometrics automate methods of recognizing a person based on a certain characteristic. You can use your face, fingers, signature any many more features to help the technology know that it’s you. Pretty soon, it’ll be common for businesses to begin using this recognition technology. Great as it sounds, using the same password for everything isn’t a smart idea. But, creating different usernames and passwords for everything can be a headache. Thankfully, there’s tons of software tools you can invest in that will help you manage. Check out PCMag’s recommendations of the best Password Managers of 2016 to get yours today. When you sign up for any service online, they tell you to put in your number to get a special code. This one-time code is only available for a limited time and helps the service prove that it’s you. That way, if someone manages to steal this code, its not enough to gain full access into the account you create. Security keys are small devices that can plug into the USB port. These keys are hardware tokens that a user can carry around at all times for protection no matter where you log in. They are are a brilliant investment to ensure the safety of your usernames and passwords. You don’t want to become a victim of identity fraud all because your passwords weren’t up to par. Do the smart thing, and lock down your login. In October, ITC will highlight the importance of IT security for National Cyber Security Awareness Month. If you or your business don’t have system in place to protect your data, let ITC build you a custom IT security solution. Call today at (512) 348-8324 to schedule a free IT needs assessment. Learn why so many people trust our business and network IT security with our team.